As I got older I came to see how in some ways, he obviously did let the sense of power get the better of him. I'm not going to not acknowledge that. But I'm choosing not to dwell on that tonight. None of us are perfect. 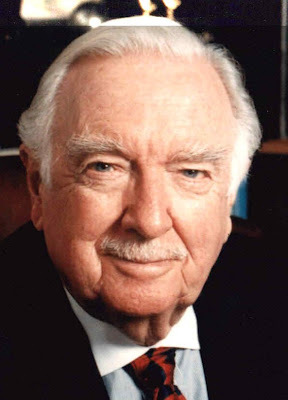 And there were fewer people that more defined television news coverage or came to be an icon of modern America than did Walter Cronkite. "The most trusted man in America" passed away at age 92 this evening. Ironically on the eve of the 40th anniversary of the Apollo 11 moon landing, which even more solidified his reputation as both a calm newsman and a giddy spectator alongside history in the making... something that happened many times over his long career.